When your customer is looking for a special solution that’s not available off-the-shelf, you’ll find that most suppliers just aren’t able to help you. They don’t have the time or expertise to produce an appropriate solution. At INS, we take pride in resolving those types of complex issues. We have the experience to assess the situation and provide a range of options enabling you and your customer to choose the solution that best fits the needs at hand. Then we have the resources to follow through, seeing your project through to completion. We’ll make sure that your client’s desires are met and exceeded, earning you the go-to status that keeps business rolling in! A longtime customer called with a special request… Their client, a large data storage facility, had been damaging contacts in the SCSI-3 assemblies they were using to patch hardware in several of their computer rooms. The connectors were the best on the market, but they were not standing up to the constant patching. They needed a SCSI product that would survive in this environment. We analyzed the situation and realized that VHDCI connectors would do the job perfectly! They were constructed like a miniature twenty five pair Amphenol/centronics type connector. They'd stand up to the constant patching, saving the client time and money. Performance of our test samples was just as we imagined, we would use VHDCI patch cords! 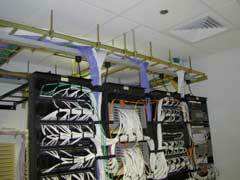 The remaining obstacle became converting the patch panels from SCSI-3 (existing cables) to VHDCI. We explored using adaptors to convert the panels, but we wanted to avoid signal and physical degradation in the system. Adapters would also be unsightly for the client, and end users who routinely tour their facilities. We decided that a SCSI-3 to VHDCI patch panel was the best option. We found that none were commercially available, so we specially designed our own. With the assistance of two manufacturing partners we had a prototype to the customer in three weeks. The final product worked flawlessly and was used in all new installations and phased into existing installations as necessary.